Chen, Ian Tsung-yen. 2018. "European participation in the Asian Infrastructure Investment Bank: Making strategic choice and seeking economic opportunities." Asia Europe Journal 16(4): 297-315. This paper asks why half of the members of the European Union (EU) have chosen to join the China-led Asian Infrastructure Investment Bank (AIIB) in defiance of substantial pressure from Washington. If the AIIB is too good an economic opportunity for Europe to ignore, then why did the rest of the EU turn its back on this organization? 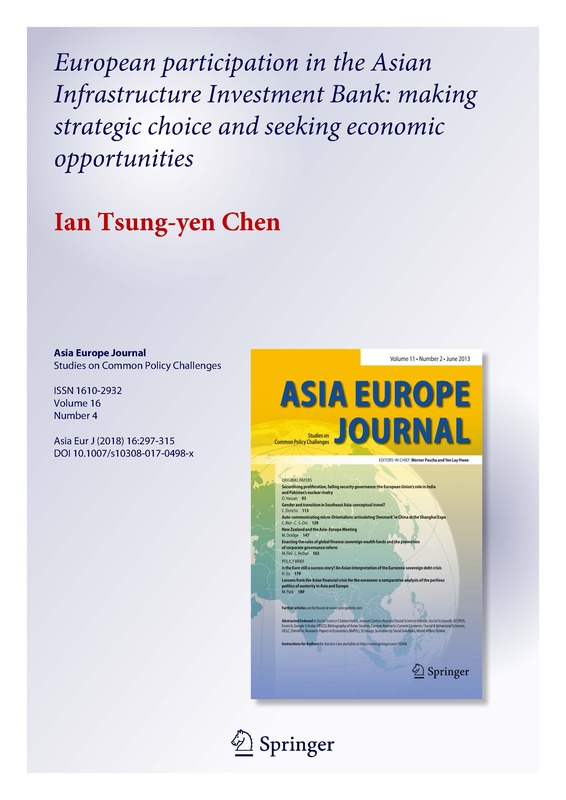 To account for this apparent variation in the attitude of European countries, I argue that, ceteris paribus, changes in the strategic situation involving Europe, the USA, and China, as well as differing expectations of economic opportunities in a developing Asia, have led European countries in different directions. Those countries which are getting increasingly friendly with China, which results from increasing level of alliance security dilemma with the USA, and are highly dependent on the potentially gigantic Asian market are the most likely to follow China’s lead. Countries that are not so geared toward China or Asia are least likely to join the AIIB. Where only one of these factors is present, the country will remain hesitant. I test this argument using both quantitative and qualitative analysis. This includes probit analysis for 31 countries and three in-depth case studies involving Germany, Belgium, and Romania. These countries have a high, median, and low chance of joining the bank, respectively. The findings of both types of analysis support the proposed analytical framework.